As a white American I feel a strong sense of guilt and responsibility for the injustices African Americans still suffer today. Not abstract collective responsibility: concrete, personal. But first the abstract. America was built on slave labor. The legacy of that slavery is deprivation for many black families even now, seven generations after emancipation. Moral white Americans have an obligation to help undo the harm America’s original sin has done to our fellow countrymen and our country. But that’s abstract, and I keep thinking of the personal. Of my white Texas family’s history. I know they were racist, but just how bad were they? Were they slave owners? Lynchers? 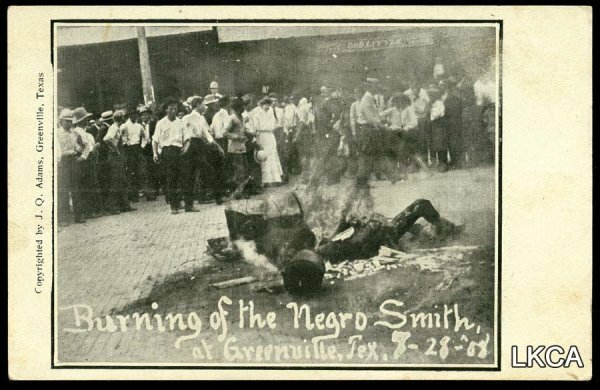 The particular cruelty in my family’s history I’d like to understand better is the murder by lynching of Ted Smith in Greenville Texas on July 28, 1908. I know the date because there’s a souvenir postcard (warning; image of burned dead man). White people in the early 1900s were so proud of lynching black men there were frequently postcards. My great-grandparents lived in Greenville in 1908. White people, town folks, he was an educated professional. Was he at the lynching? Did he approve? Are they in the crowd in that postcard? I got thinking about these questions after reading an article about the lynching of Leo Frank in Georgia. They made souvenir postcards too. One thing the article notes is that in 2000, someone made a list of some of the lynching participants. I wonder if such a list could be made for Greenville? Would my great grandparents be on it? The motto of Greenville, TX was The Blackest Land, the Whitest People. They displayed that proudly on a banner over the center of town through the 1960s. These are my people.